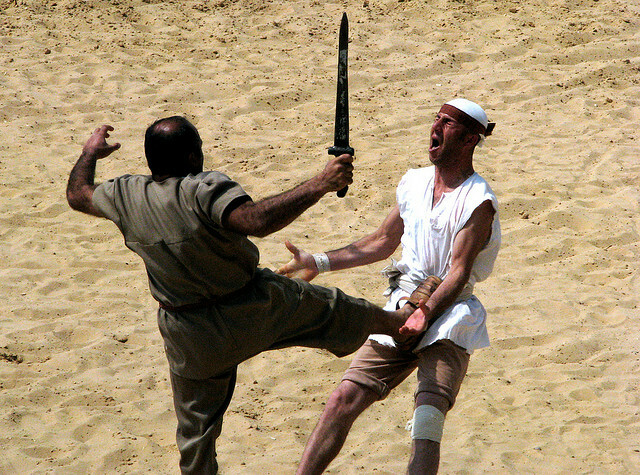 Lexicolatry: Elumbated - "Weakened in the Loins"
Elumbation can be caused by a number of activities, including getting kicked in the testicles during a gladiatorial contest. Adjective. Now jocular. Rare. Late 18th century. It's not very often that a word's definition confuses me more than the word itself, but I am a little puzzled by elumbated - what exactly does 'weakened in the loins' mean? Nor is it helped by the fact that there seem to be very few uses of this 'rare' and 'jocular' word - the OED only lists two: an entry in a lexicon from the 18th century, and from the Confess. of Medwin (1882) the rather perplexing quote "Our elumbated tailor came forward." Hmm. Such scant use, therefore, leaves me to surmise at the exact meaning of 'weakened in the loins', and I must assume it has something to do with one's declining efficacity in the realm of procreation, perhaps as one ages. That's a good definition, right? Having declined in efficacity in the realm (art?) of procreation. Good. I'm glad we've cleared that up. Do please leave your most [insert inappropriate pun here] comments in the box below. ...I'm not helping, am I?